No matter where you go in Connecticut, the 2019 Volkswagen Atlas SUV is ready. Between the 2019 Volkswagen Atlas 4MOTION® all-wheel-drive technologies and 2019 VW Atlas safety features, this new SUV has it all. Upgrade to the 2019 Volkswagen Atlas V6 SE, for sale at our Volkswagen dealer near Southington, CT, and relax in a 2019 VW Atlas interior with comfortable seating options. For a sportier ride, inquire about the 2019 Volkswagen Atlas R-Line. Get into a 2019 Volkswagen Atlas lease at a competitive price by visiting Harte Volkswagen of Meriden and discussing your VW finance options with one of our experts. Don't know if the 2019 Volkswagen Atlas has enough room for your gear? 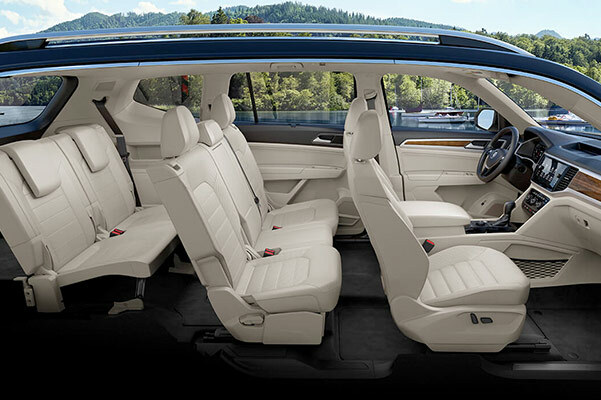 Discover all the different 2019 Volkswagen Atlas configurations that allow for more interior space when you visit our Meriden Volkswagen dealer. Drive home in a new 2019 Volkswagen Atlas lease now.